They arrived in Jerusalem with their camel caravan after spending more than a month on the road. These wealthy and wise men called the Magi were clearly men of means—their style of travel was the first-century equivalent to a sleek, sophisticated Motorhome more than it was an ancient VW bus. On-the-street speculation about the purpose of this visit quickly ended when these dignitaries started to inquire about a newly born king of the Jews to whom they had come to pay homage. Herod (the Great) was more than a little interested when he heard what had brought these esteemed men all the way to his kingdom. Appointed by the Roman Senate as king of Judea, Herod was popularly known as “King of the Jews,” though he was a non-practicing convert. As King of the Jews Herod naturally viewed any baby considered to be an heir to his throne as an eventual threat. Herod called some of the same Jewish scholars with whom the Magi consulted, and learned that the baby king had been prophesied to be born in the little town of Bethlehem, a suburb of Jerusalem. Pretending that he too wanted to worship this baby in Bethlehem, Herod told the Magi to let him know when and if they found him. We know the rest of the story, don’t we? The story of Herod’s absolute, iron-fisted sovereign power over Judea takes one through a maze of plots, lies, treacheries, corruption, backroom deals, political chicanery and executions. Herod’s willingness to do whatever was necessary to serve his own interests makes modern day, ruthless gangsters like the fictional Godfather seem almost charming by comparison. Herod was a first century despot every bit the equal of 21st century madmen, intent on violently obliterating any and all potential threats to their selfish desires. A tale of greed and political corruption mixed in with a good dose of family values. “Chasing 120” is a story of corruption and deceit. Dr. Tyler Belknap was a former ad executive turned preacher. Down on his luck he uses his skill in sales to build a huge empire called Wellness 120. It revolves around the fact that Belknap believes, or sells the idea of, people living to the age of 120 years old by eating the right foods. As a preacher he uses the Bible as his source for information and he creates a cult following of his Wellness 120 concept. It's in the Bible so how can it be wrong? Belknap makes millions of dollars on sales of his supplements that supposedly help people reach their goal of living till 120. No one doubts him. Problem is Belknap is a con-man and sham artist. When people start getting sick from his supplements his empire begins to crumble. A well written tale by author and political cartoonist Monte Wolverton. The characters are multilayered and extremely interesting. The story is believable because we see people like Belknap everyday on TV hawking their products and nonsensical beliefs. I really enjoyed the family relationship between the main characters Dave Whitman and his wife Marcia. Dave has worked at Wellness 120 for years and we come to realize even most of Belknap's employees are brainwashed. The turning point for the Whitman's is when their son becomes ill and they must face the reality that it is the supplements that have caused his problem. I am not a religious person so when I started reading this I had it in my head that I wouldn't enjoy the story knowing it has religious undertones. I struggled through the first chapter because of that fact. Once I realized the story wasn't pushing Biblical ideology I fell into the story and really enjoyed it. Sure it has verses from the Bible but they were placed in the story appropriately and didn't feel forced at all. The story moves at a nimble pace and the book is a quick read. Bottom line is I recommend the book to anyone who likes a good conspiracy tale with interesting characters. Belknap is both lovable and detestable. He does good things for people but like all con-men he is really doing these things for his own hidden agenda. I don't believe in the Bible anymore. I used to, though. This is a choice I’ve made. 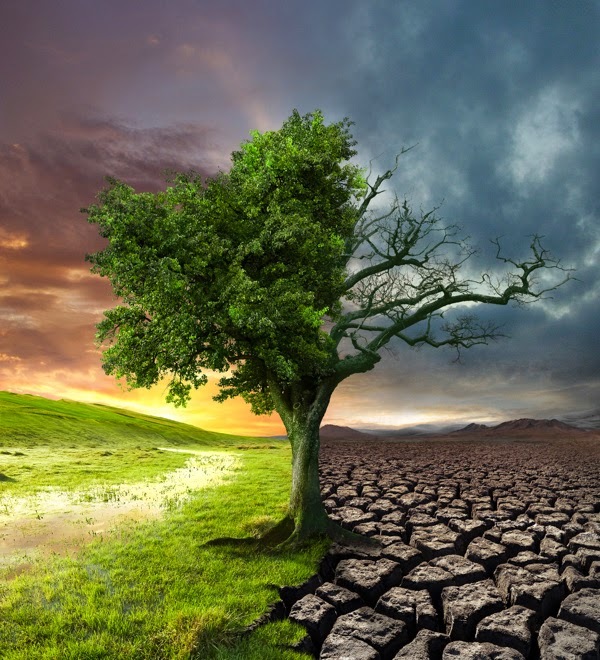 “Belief” in God connotes— at least as I see it—a set of ideas about God that may, if time allows, eventually make their way to other parts of my being. The older I get, making sure all my “beliefs” of God are lined up as they should be loses more and more of its luster. I see the Bible focusing a lot more on something far more demanding: trust. Try it. Which is harder to say? I believe in God or I trust God? I see a huge difference between “I believe in a God who cares for me” and “I trust God at this particular moment.” The first is a bit safer, an article of faith. The latter is unnerving, risky— because I have let go. You’ve all heard of the “trust fall.” There’s a reason they don’t call it a “belief fall.” Belief can reside in our heads. Trust is doing it, risking it. Trust is humility, putting ourselves in the hand of another. Trust requires something of us that belief doesn’t. When God promises Abraham that he will have more offspring than the stars in the sky, translations of the next verse conventionally say that Abraham “believed” God. (Genesis 15:6) “Believe” isn’t the right word there. “Trust” is. The Hebrew word is the same one we get “amen” from. “Amen” is not a social cue that grace is finished and it’s time to eat. It is the final word in the prayer: we’re done talking now, Lord, and we now move to trust. God promised an old man a lot of kids. Abraham trusted God to come through. That is way harder than believing. Believing has wiggle room. Trusting doesn’t. Note: the following parable is a teaser for my forthcoming book, A More Christlike God, to be released May 2015. 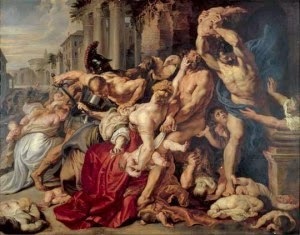 The 'wrath of God' is like the hammer-throwing contest my father warned me against as a child. 'Do not,' he said, 'throw hammers in the air.' Apparently he saw this as a good warning in fatherly love. I saw it as a challenge and a rule to be broken. 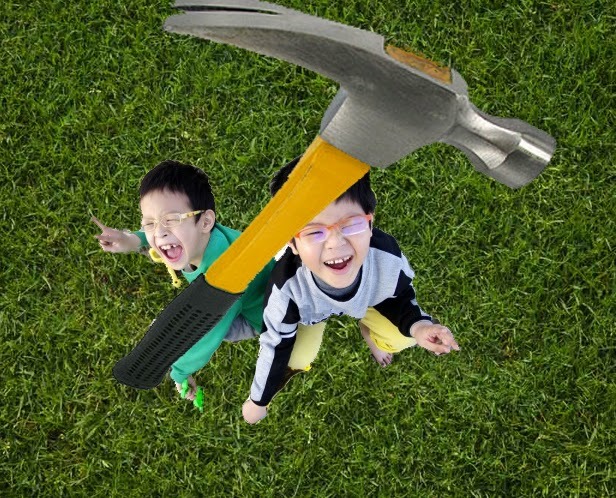 My neighbour Dougie and I (perhaps 7 years old at the time), each took our father's hammers and had a contest to see who could throw his hammer higher. Straight up. Perhaps I won. Certainly Dougie lost. For my hammer soared skyward, then descended directly onto poor Dougie's skull. Blood everywhere. Screaming followed. Then I found myself running home, locking all the doors and hiding in my room. Shortly, the phone rang (Dougie's mom) and we were flying to the hospital where doctors were already stitching up Dougie's head without the possibility of anesthesia. More screaming. It did not escape me that the wrath intrinsic to my sin caused both Dougie and I a great deal of suffering, even though my father's response was only love and comfort. The wrath did not involve or require any active punishment. I did not imagine that my father had struck Dougie with the hammer for participating in my rebellion. Nor even that when Doug's father held him down while the surgeon applied sutures that this was somehow an act of vengeance. The wrath of our fathers was a self-inflicted experience of rejecting and receiving their loving care. It seems to me that taking me to the hospital where I could hear the screams was a torment worse than retribution, in that I had to see the pain I had caused and I wasn't allowed to allow me to cower in my room in a sort of self-loathing denial. It was also the most important element in moving forward to owning my rebellion (far more effective than a spank) but also reconciliation with my victim. I wonder if this might be close to the truth of the 'great and terrible day' of the Lord's final judgment. Judges 4:21 - Then Jael, Heber’s wife, took a tent peg and took a hammer in her hand, and went softly to him and drove the peg into his temple, and it went down into the ground; for he was fast asleep and weary. So he died. Jeremiah 23:29 - "Is not my word like fire," declares the LORD, "and like a hammer that breaks a rock in pieces?" Jeremiah 50:23 - How the hammer of the whole earth has been cut apart and broken! How Babylon has become a desolation among the nations! Jeremiah 51:20-23 (MSG) - 20 God says, "You, Babylon, are my hammer, my weapon of war. I'll use you to smash godless nations, use you to knock kingdoms to bits. 21 I'll use you to smash horse and rider, use you to smash chariot and driver. 22 I'll use you to smash man and woman, use you to smash the old man and the boy. I'll use you to smash the young man and young woman, 23 use you to smash shepherd and sheep. I'll use you to smash farmer and yoked oxen, use you to smash governors and senators. 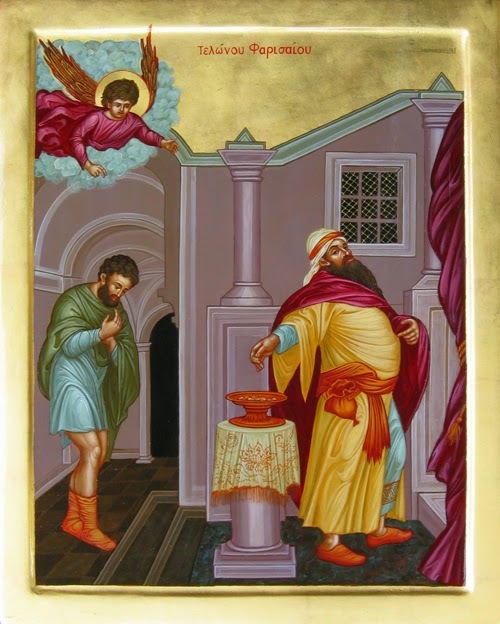 To some who were confident of their own righteousness and looked down on everybody else, Jesus told this parable: Two men went up to the temple to pray, one a Pharisee and the other a tax collector. The Pharisee stood up and prayed about himself: “God, I thank you that I am not like other men—robbers, evildoers, adulterers—or even like this tax collector. I fast twice a week and give a tenth of all I get. Today we’re going to talk about church. The core ingredient of being the church is being in Christ. If we are in Christ, and he is in us, we are the church. Notice I said—we are “the” church, which is entirely different from being members of or part of “a” church. The church is the universal body of Christ. It is not comprised of or defined by any specific incorporated legal entity. All of what the universal church is—its entirety, its unity, its beauty and its totality—is not visible. The body of Christ is everyone in whom Jesus lives, everyone who trusts in him, everyone, regardless of their affiliation with a legally incorporated church, or lack thereof. All of the rest of what we so often think of when the word “church” comes to mind—buildings, special architectural features, “holy” rituals, ornaments and all of the activities, programs, services, small groups, Bible studies, discipleship programs, missions , picnics and softball games—all of it either can help or harm us. But, such physical properties are not essential, foundational, core elements that determine whether we are the church. Your attendance, or lack thereof, with a group of people, in a particular building, at a particular time, at a specific address, on a piece of real estate, performing specific religious rituals has little, if anything, to do with whether you are in Christ. Such behaviors and practices may help or hinder your relationship with Jesus, but they do not assure it. "It is sweet and fitting to die for your country." Dulce et Decorum Est? Sweet and fitting? Owen goes on to bitterly describe the convulsive gargling of ‘froth-corrupted lungs’ and says NO! 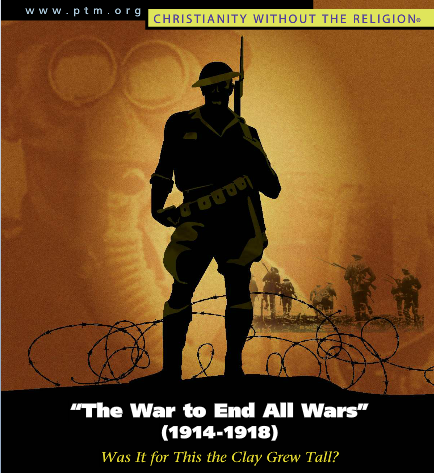 Participants in ‘the Great War’ would never recount such a lie to children who dream of doing or being something glorious. The Greek poet, Horace, who coined the phrase, had never seen chemical warfare. Neither had we until network news brought us images from Syria last year—hundreds of civilians, including children, wrapped in death shrouds awaiting burial. Barbaric. Inhuman. But remember who it was that first invented and employed gas attacks: supposedly ‘Christian’ nations at the height of industrial civilization, mutually destroying one another in the greatest human disaster since the Black Death (1348-50). Nine million dead before all is said and done. Wilfred Owen knew the futility of war. Like Mr. Howell, an English teacher by profession, Owen enlisted after visiting wounded soldiers in a hospital. He fought for two years, was injured, but then returned to the front. Three months later, on Nov. 4, 1918, he died in a machine gun attack, exactly one week before the war ended. The issue can be settled into two terms: the Bible teaches truth but it does not teach thepath. 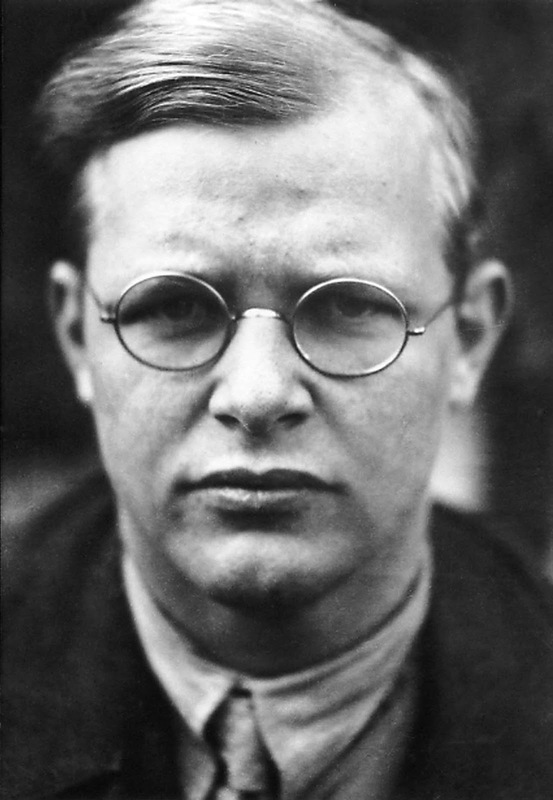 These two terms are Bonhoeffer’s and emerged from the intense discussions in the Confessing Church on whether their pastors should pursue legalization under Hitler or remain “illegal” and dependent on free will offerings by the parishes that called them and would support them. The other misunderstanding concerning scriptural evidence stems from the same root: one now looks to justify our paths not for the past but for the future. We expect from Scripture such concrete directives that we are released from acting on faith; one wants to see the path before walking on it. One demands the certainty that the path will certainly be pleasing to God before starting the journey. One says: if we could be absolutely certain on the basis of Scripture that the path of the Council of Brethren is pleasing to God, then we would follow it. Demonstrate this from Scripture and we will follow. Thus I want to have the scriptural evidence in my pocket as the guarantee for my path. But the Bible can never fulfill this kind of request either, because it is not intended to be an insurance policy for our paths, which may become dangerous. The Bible does only one thing: it calls us to faith and obedience in the truth that we know in Jesus Christ. Scripture points not to our paths but to the truth of God. Scot McKnight is a recognized authority on the New Testament, early Christianity, and the historical Jesus. McKnight, author of more than forty books, is the Professor of New Testament at Northern Seminary in Lombard, IL. He looked at me and said, “It happened while I was in church. It was the end of the service, everyone was standing, and so was I. I was doing the same religious thing that everybody else was doing, the same religious thing I had done for over 25 years. My family was there. 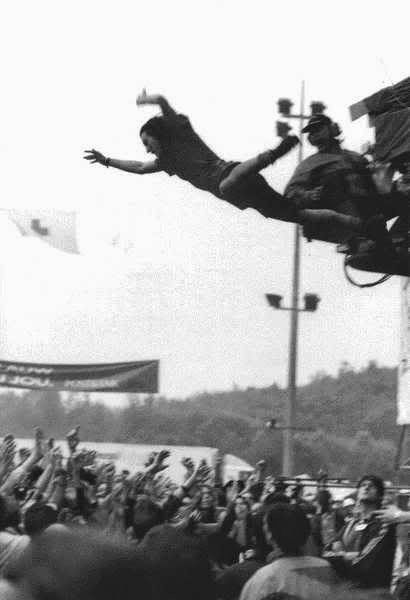 My mother was there. It was the same place we always went. We did the things they told us we should. The sermons usually either scolded us or berated us. “I realized that I had sat there in church hundreds of times, filled with guilt and shame as a result of the sermon, and every time I resolved that I would do better. Each time I determined to do a bunch of stuff that I really believed would make God happier. For all those years I really thought I could influence how God thought about me. All those years I thought it was all about me and what I did or did not do. “But that day in church it suddenly hit me. Based on an honest evaluation of my progress in twenty-five years, I hadn’t changed that much. Twenty-five years of beating my head against a wall. Twenty-five years in the same church, several different pastors, but it had been the same old beat-’em up message. Twenty-five years of the same old spiritual muggings. Twenty-five years of the same old ‘you’ve got to do more’ diatribes. center of religion. There he was, in formal, structured services, a time when he was told when to sit down, stand up, kneel and how many religious hoops he needed to jump through. And it was there, during a time when he was enduring his weekly browbeating that he realized it was all a sham. What he was experiencing was nothing but dead religion. The following is a dialogue between Brad Jersak and Peter Hordern, about Pauls' use of retribution language (in 2 Thessalonians 1), rhetorical criticism and the nonviolence of God. Peter: I'm continuing to wrestle with the idea of God as nonviolent. 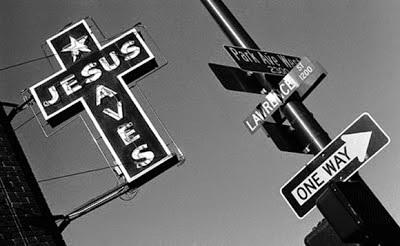 I feel like I see the truth of God's nonviolence through Christ and his teachings, particularly on forgiveness. However, then I also read what Paul writes, especially in his epistles to the Thessalonians, which refer to end times and Gods punishment. What do we do with that? Is it our wishful thinking that God really is as loving as we want Him to be? 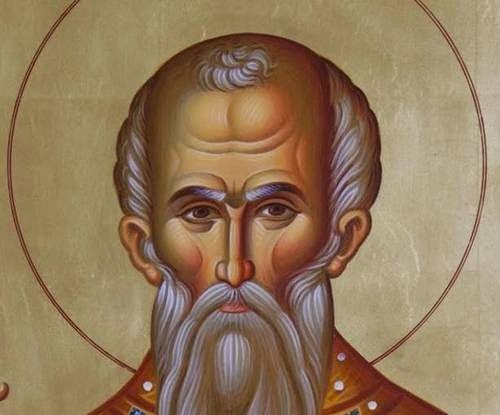 Or do we pass off Paul's writings as a man trying to encourage a church in persecution with Gods justice, in order to give meaning to their suffering? Are there different translation possibilities? What do the words 'punishment' that Paul writes about really mean? For all things are arranged with a view to the salvation of the universe by the Lord of the universe, both generally and particularly. . . But necessary corrections, through the goodness of the great overseeing Judge, both by the attendant angels, and by various acts of anticipative judgment, and by the perfect judgment, compel egregious sinners to repent. (Strom. 7.2 ANF 2). As many of us know, perhaps quite personally, what often goes wrong happens in the “help” part of this equation, mainly because of the index we use to insure the moment has been tended to. One or two things generally happen. One, the minister (I’m using this term broadly here) coats a painful–or beautiful–circumstance with a platitude or cliche, something that adds the whiff of a God-dimension to the room without actually waiting for God to say anything. Second–and this often happens because of the first–the door closes in the room. For whatever reason, whether it be the minister’s legitimate fear of the moment’s meaninglessness, or just lazy agitation with the emotions you don’t feel, the minister closes the door to what’s allowed. Feelings become encased in ought-to-feels, and the soul’s basement adds one more box of latent resentment and grief. 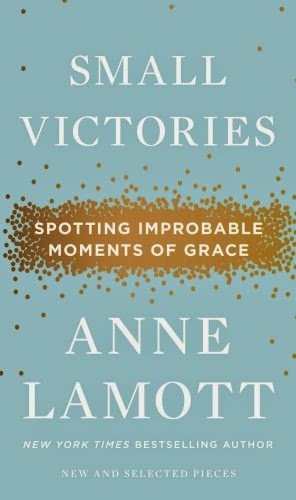 Enter the courageous Anne Lamott, the dreadlocked sufferer who’s been unpacking boxes, in narrative form, for the last thirty years, and has just released her most recent collection, Small Victories: Spotting Improbable Moments of Grace. Salon just did an interview with her about the new book, the reason so many of her stories have to do with suffering, and the state of her Match.com prospects as a cellulit 60-year-old. She talks about the fear we have, as both the recipients and companions of trauma, of dealing with that trauma. Aging helps, she says. You find you care a little less about how you ought to feel in certain situations. At the same time, she lays out an impeccable blueprint for what “pastoral care” ought to be about. And it begins with being a sufferer yourself. I said the prayer to be saved when I was ten years old. I don't remember much about it—just that my mom was upset that the church I was attending with my friend would baptize a child (me) who was not really sure what was going on. Many years later, in another church service, I asked Jesus to come into my heart again. The pastor announced to the church that I was rededicating my life. Yet looking back, I feel that God was with me all along. Is it possible that I was truly saved when I was age ten, even though I was unaware of its great importance? I know that God knows my heart and I have a great passion for my relationship with Jesus. Should I be concerned about my testimony? I think the whole idea of trying to determine an exact time when someone is "saved" is somewhat manipulative. Fixing an exact time has more to do with what we are thinking and doing than what God is doing. Consider—when people talk about when they were "saved" they are often recounting when they determined, in some way, perhaps in some emotional context, to serve God. While there's nothing wrong with remembering the exact time when we gave God our commitment, that memory is, at the end of the day, more about us than it is about God. Is the time we decided to make a commitment to God, then, the exact time when we were "saved"? Well, no it isn't, because the Bible clearly tells us that repentance is a gift God gives to us. The Bible tells us that we cannot respond to God unless and until we become aware that he loves us first. So, any moment in time that we recall, any religious place where we happened to be or any religious thing we were doing or performing, is not the moment of our salvation.